Inspirational Leadership! – Moving Your Team from Apathy to Full Engagement! In November 2018, I had the wonderful opportunity to serve as a keynote speaker for a Fall Student Leadership Conference at the University of North Georgia. My keynote presentation for this leadership conference was entitled, “Re-Defining Leadership in the 21st Century”. Throughout the sixty-minute keynote presentation, I not only provided student leaders with an historical journey of leadership over the past 100 years, but I shared with them a working definition of leadership, eradicated some of the leadership myths that exist within our culture and society, and let them know that everyone has the power to lead. In effect, although there are multiple definitions of effective leadership, I explained to them that effective leadership is not defined by position, title, or status, but based on behaviors possessed to empower others. In addition, I also shared that one of the attributes of effective leadership is the ability to inspire others to achieve their desired goals. In essence, I explained that effective leaders not only possess a vision to make a positive impact, but they have an incredible ability to inspire others towards a common vision or goal. Within various circles, this quality of leadership would be defined as inspirational leadership. Inspirational leadership not only consists of an ability to inspire people to reach greater heights of performance and success, but according to Austin (2009), inspirational leaders develop an agenda and create a culture which educates, motivates, and inspires. 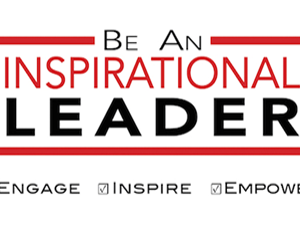 Based on my experiences as a high content speaker who specializes in leadership development, and labeled as an inspiration by various speaking audiences and clients, I wanted to take this moment to share with you five keys to becoming an inspirational leader in the 21st Century. Although this can seem like a simplistic quality of inspirational leadership, it’s actually one of the most important keys in inspiring your audiences and those you serve. This quality is important because in order to truly inspire, you must know who they are, what drives them, what their passion is, and what matters most to them. In effect, if you’re going to inspire others, it will require you to gather data about the people you are leading and make sure you are creating positive results. To expect positive results of your inspirational leadership, it is important to take the time to meet with members of your team, learn about what matters most to them, identify their why, and be willing to make adjustments in order to inspire others to reach their fullest potential as members of the team or organization that you lead. Several years ago, there was a sales study done at Stanford University on the keys to becoming an effective sales person. During the study, they asked a group of people, what qualities of their salesperson inspired them most as they purchased products. Shockingly, the technique of the salesperson was not rated the highest, what was rated the highest was the enthusiasm and passion of the salesperson. Subsequently, although an inspirational leader is not a salesperson, the ability to lead and communicate with passion has a huge impact on your ability to inspire others. Now, inspiring others does takes more than passion, but to be effective at inspiring others, it’s vitally important you have demonstrated the passion behind your communication and leadership style. In my diversity and inclusion presentations, I speak about the importance of adaptable leadership. I share that adaptability consists of being able to modify, or change your behavior, communication style, or methods of doing things in order to reach others and create a space where they can reach their fullest potential. As a leader of diverse individuals, this is important to understand because of the different learning styles, personalities, and ways that people are motivated. For example, one person may be motivated by one on one discussions about performance while another may be motivated by a special film that you decided to share with your team. Subsequently, one strategy is not better than the other. The key is to know your people, create a tool box of strategies you can use to motivate and inspire others, and be flexible as a leader. This attribute can be challenging, but at the end of the day, it’s a set of skills that will help you become better equipped with inspiring the members of your team. Several years ago I was in the process of completing my fourth book on relationship success. During this time, I was doing research and learned that it takes five positive words to eradicate one negative word. In effect, the individuals that shared this relationship concept talked about the importance of filling up your relationship partner’s love bank. As I pondered and practiced this relationship strategy, I realized that it can be seen as a leadership skill set as well because leadership consists of building relationships. Also, I have found that the more encouraging and empowering you are, the more likely the people you serve will be more resilient and inspired by you on a daily basis. Therefore, as an emerging or seasoned leader, I encourage you to be a consistent encourager as you lead because it will truly have a lasting impact on the growth, resilience, development, and success of your team! The final key that I would like to share on inspirational leadership is the importance of challenging the members of your team to reach their full potential. I believe inspirational leaders have the responsibility to challenge people to attain a higher level of success personally and collectively. For example, when you think about inspirational leaders such as Dr. Martin Luther King Jr., Nelson Mandela, Mother Theresa, and many others, you will find that as a leader, each of these amazing leaders challenged people to reach their fullest potential, challenged people to pursue something bigger than themselves, and more importantly, challenged people to attain the greatness on the inside! Moving forward, as you strive to be an inspirational leader, I encourage you to get to know your team, communicate and lead with passion, be adaptable, consistently encourage and empower, but most importantly, I CHALLENGE you to be strategic as you develop ways to positively challenge the people you lead.